Just a few blocks north of the Sept. 11 memorial, investigators were combing over a long stretch of the Hudson River Greenway that Tuesday became the site of the latest horrific attack on America. NEW YORK — At 8:45 a.m. Wednesday — the minute at which the first plane crashed into the World Trade Center’s north tower in 2001 — Charles Roth stood at the edge of the sunken memorial here, remembering his friend. More than 16 years have elapsed since 9/11, and the geography and character of this swath of Lower Manhattan are dramatically different. But Wednesday, it felt like not so much had changed. Just a few blocks north of the memorial, investigators were combing over a long stretch of the Hudson River Greenway that Tuesday became the site of the latest horrific attack on America. Eight people were killed when a man who allegedly pledged allegiance to the Islamic State plowed a rented truck onto a busy bicycle path a little after 3 p.m., leaving a trail of carnage and pain. For many here, that pain and its aftermath are frighteningly familiar. Students and staff at the Borough of Manhattan Community College said they’d heard what sounded like gunshots and emerged into a chaotic police operation. Passersby told stories of wandering into something approximating a war zone, littered with broken bodies. Roth, a 47-year-old business director who grew up in Huntington on Long Island, was on the subway Tuesday afternoon when his train halted at Chambers Street. He didn’t think much of it. The trains stop all the time for “police activity” that riders never hear about again. But overhead, chaos was raging. When Roth finally emerged from his trip, his phone started buzzing incessantly with frantic texts from his mother asking where he was. “Mom, you gotta cut the cord,” he thought. Then he looked at his Twitter feed. Roth doesn’t come to the 9/11 Memorial much. Frankly, he said, he tries to avoid it. It makes him think about the day officials informed his friend’s family that they’d found a few of his fingers in the rubble. But when he looked around Wednesday morning, he saw people carrying on as if nothing had happened. “Everybody was still on their phones,” he said, their fingers tapping at screens. He decided to stop at the solemn park where the name of his high school friend is etched into the stone: Michael Desmond McCarthy. “It almost felt like, ‘How have we progressed — or fixed anything?’ ” Roth said. Wednesday morning, swarms of pedestrians made their way around police barricades or tried to talk officers into letting them cut across the crime scene. A security guard on the bike path, just south of where the battered Home Depot truck used in the attack still was parked, said people had already been begging to ride on through, although the volume of travelers was much lighter than usual. What does it say that we’ve become, at least in some measure, inured to this sort of carnage? That the frantic texts from Mom are, if not routine, at least expected? Facebook now allows users in close proximity to the latest calamity to mark themselves “safe” — a smart and valuable service that is, if you stop to think about it, fairly horrifying. On Wednesday, as teams of investigators in puffy white suits stalked shoulder-to-shoulder, inch-by-inch up West Street, Charlie DiMaggio stopped to contemplate the memorial to the people killed in 2001. The NYU epidemiologist was on his way to a long-planned meeting about, of all things, pedestrian safety. His research into people being struck by cars does not contemplate the prospect of a man intentionally plowing into a crowd of bicyclists and pedestrians. “You feel a pull,” DiMaggio said of his decision to stop off for a few minutes. He, too, knew people who perished here. The memorial, he said, “makes you remember the resiliency” of New Yorkers. A worker was wiping down the nearly 3,000 names etched into stone here. 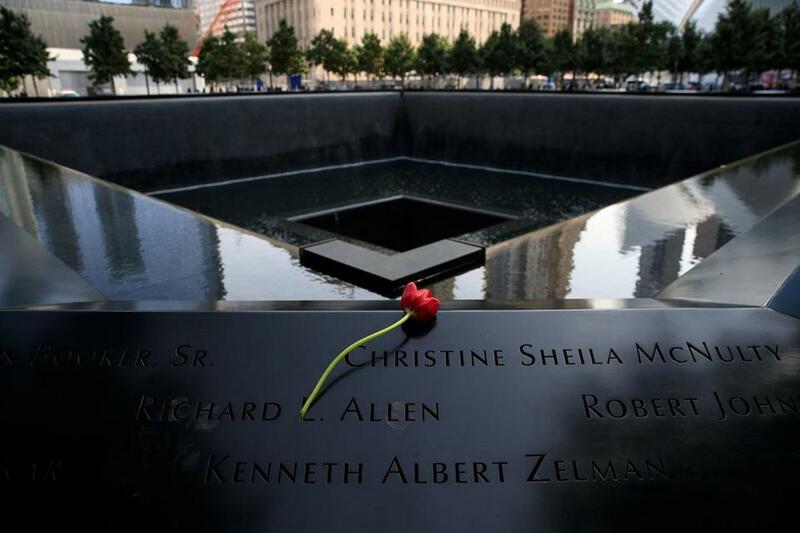 Another placed roses on the names of those 9/11 victims who would have had birthdays Wednesday — six in all. A few steps from the south tower memorial stands the Survivor Tree, a Callery pear that somehow withstood the rubble and fire. It’s a symbol of resilience and strength, where staff and visitors place signs and flowers honoring the victims of attacks all over the world. By 9:03 on Wednesday morning — the moment the second plane hit the south tower 16 years ago — a few bouquets and a sign remembering Tuesday’s victims were in place at the tree.